A principal of a school listed as facing “sustainability issues” by the Education Authority in a new report has said small, rural schools are “priceless”. Mrs Florence Mairs, principal of Straid Primary School near Ballyclare in Co Antrim, was speaking after the Education Authority published its 2018-19 action plan. The plan sets out proposed changes, some of which include increases or decreases in enrolment and the opening of new nursery units, for the period up to 2020. This year’s report lists around two dozen schools facing what it calls “sustainability issues”, meaning they may be forced to close or merge with other schools in the future. Last year’s action plan identified 40 such schools. Most, but not all, of the schools identified as facing sustainability issues can be found in rural areas, rather than in urban centres such as Belfast and Londonderry. The Department of Education’s sustainable schools policy states that primary schools should have 140 pupils in urban areas and 105 pupils in rural areas. Straid Primary School, with an enrolment of 43 pupils for the 2017/18 year, falls well under. It is just one of the many schools identified in the report as facing an issue with sustainability. Mrs Mairs said that, despite her school being listed in the report, she was confident of the long-term future of the rural primary. 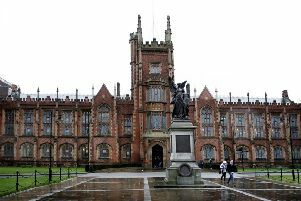 “We are very confident that we are sustainable, we have no worries about that,” she told the News Letter. She also highlighted the “priceless” contribution small, rural schools can make. “The role of these types of schools is so important, particularly in small villages where it can often be only the church and the school at the centre of the village. “Historically rural schools have been proven to produce the goods by providing a good, academic education, an environment where the children are safe and can thrive and blossom. EA Director of Education John Collings said: “In many areas of Northern Ireland there are too many school places for the size of the population, while in other areas, there are not enough places. He continued: “Area planning seeks solutions to these issues to ensure all pupils have the opportunity to fulfil their potential.